Among primers on meditation, this book is exceptional in how it guides readers who treasure inner growth and are looking for reliable direction on how to achieve it in an authentic and sustainable way. The author, a student of the Indian yogi Paramahansa Yogananda, distills the teachings of many other spiritual traditions and religions, including Christianity, into an interfaith perspective that will appeal to all seekers of the divine. Specific elements include the foundations of spiritual practice; the benefits of energy-building exercises, affirmations, and healthy lifestyle regimens; instructions in mantra practice and inner-sound meditation; techniques for effective prayer; and guidelines to measure inner practice. Among primers on meditation, this book is exceptional in how it guides readers who treasure inner growth and are looking for reliable direction on how to achieve it in an authentic and sustainable way. The author, a student of the Indian yogi Paramahansa Yogananda, distills the teachings of many other spiritual traditions and religions, including Christianity, into an interfaith perspective that will appeal to all seekers of the divine. Specific elements include the foundations of spiritual practice; the benefits of energy-building exercises, affirmations, and healthy lifestyle regimens; instructions in mantra practice and inner-sound meditation; techniques for effective prayer; and guidelines to measure inner practice. The book’s accessible narrative and universal themes make it enjoyable to read and life enhancing to apply. Meditation as a Way of Life by Alan L. Pritz was recently featured in the monthly e-zine Mystic Living Today. Meditation as a Way of Life author Alan L. Pritz was recently interviewed on The Inessa Blog. Meditation as a Way of Life by Alan L. Pritz has been reviewed by Michelle Kaye Malsbury on the Book Pleasures blog. Meditation as a Way of Life Reviewed in Yoga + Life Magazine! Meditation as a Way of Life: Philosophy and Practice Rooted in the Teachings of Paramahansa Yogananda by Alan L. Pritz has received a wonderful review in Yoga + Life Magazine. Meditation as a Way of Life: Philosophy and Practice Rooted in the Teachings of Paramahansa Yogananda by Alan L. Pritz is being featured on Reality Sandiwch in the form of an exclusive excerpt. Healing without Medicine and Meditation as a Way of Life have been reviewed in the Midwest Book review. 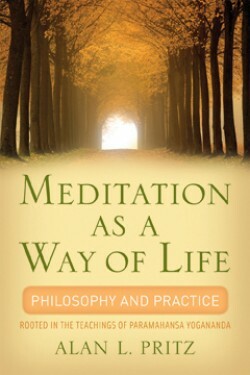 Meditation as a Way of Life by Alan L. Pritz has received a wonderful review from Lissa Coffey, host of CoffeyTalk.com. Embattled Saints and Meditation as a Way of Life have won 2015 Benjamin Franklin Silver Awards! A wonderful review of Meditation as a Way of Life by Alan L. Pritz by the Midwest Book Review. A wonderful review of Meditation as a Way of Life by Alan Pritz appears in the New Age Journal. Meditation as a Way of Life author Alan L. Pritz will be on the LIVEWIRE radio show February 25! "Alan Pritz has written one of the best meditation guides in years. Meditation As a Way of Life is clear, uncomplicated, inspiring, and straight from the heart of a true expert who's been there. The benefits of meditation are now known to be deeper than most people imagine. Don't deny yourself these advantages toward a happier, healthier, and more fulfilling life. Highly recommended." “Meditation as a Way of Life is a wise, user-friendly guidebook for your spiritual journey. Folks of all faiths will find interesting, practical, "how-to" tips for stretching, breathing, meditation, and more. I found the book a very interesting, unique read. Thank you Alan!" -Lilias Folan, Author of Lilias! Yoga Gets Better With Age and host of PBS Yoga series Lilias!